The EU is on a tight schedule. Which makes three of us (including the reader). Our prophecy timeline is compressing more than it would initially seem. Despite his age and apparently calm demeanor, Javier Solana has fulfilled various prophecies in Daniel and Revelation. The EU is now in a position where Solana could easily return to some kind of office, and fulfill yet another prophecy (Daniel 11:38). This prophecy describes the Antichrist as a king who is really big into defense spending. As is typical of prophetic fulfillments surrounding Javier Solana, the EU's new defense spending program is riddled with 666 connections. This is in contrast to the PESCO program, which has no substantial 666 connections to it. * I have never seen so many "666's" in my life to an EU event or program, other than to Javier Solana himself. The PESCO program is a series of commitments that each country intends to fulfill in the military arena, in terms of troop deployment and capability development. In addition to the commitments (which are binding to every country) it has "projects." Each country must sign up to at least one project. Solana has been pushing for PESCO to be used to build what he called a "European Defence Union." A former subordinate of Javier Solana, Nick Whitney, wrote a piece about how the PESCO that has been created is laughable. Furthermore, PESCO is hardly as ambitious as what Solana envisioned it in his 2015 pamphlet, "More Union in European Defence." Considering Solana has written an article criticizing the EU's defense package in the past, it would be absolutely unsurprising if he too thought it was a joke. If PESCO is turning out to be a joke before it is even off the ground, then what hope do EU defense watchers have left? A podcast of EU Defense experts suggested that the EU's new defense fund could make real progress. 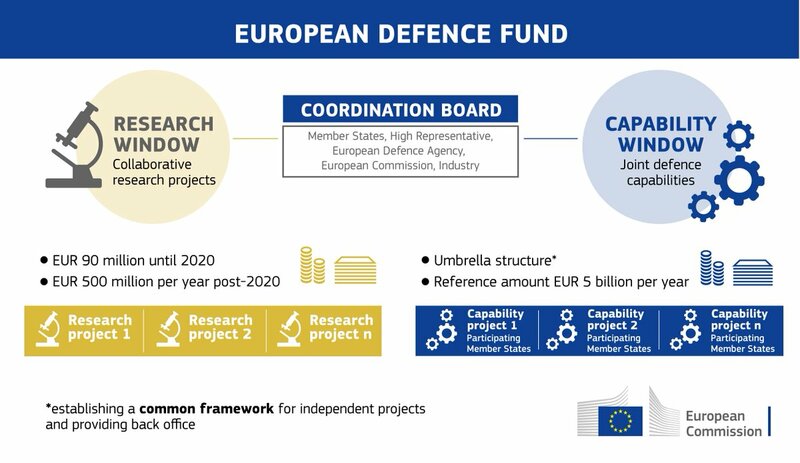 The EU's defense fund uses EU money to incentivize countries to research and develop weapons together. PESCO involves no actual EU money. PESCO is the military commitments, the European defense fund is the actual bonus money. However, PESCO projects get an even bigger bonus if they are financed using the European defense fund. Though they are separate programs, they are intended to reinforce each other. The EU's defense fund was already launched back in June. It has two parts: the weapons research part and the weapons development part. The weapons research part already has funds allocated to it. The weapons development part is being rushed through Council and Parliament, with a view to it's ratification by March 2018. I watched the European Parliament defense committee debate the weapons development portion (EDIDP), which has yet to become a law. (1) The rapporteur remarked that the EU is on a tight schedule. If they can't get EDIDP ratified in the early part of 2018, there is concern that they wouldn't be able to launch projects by January 2019, which is the beginning of the time frame (2019-2020) for the EDIDP. Both of these are somewhat temporary injunctions, with the hope that both parts are formally placed in the EU budget in the post-2020 EU budget (which is normally 7 years). See the chart below from the EU Factsheet for an outline of what this looks like. Who Will Run the EDF? Since the European Defense Fund (EDF) has two parts, it is necessary to coordinate the two parts. Therefore, a "coordination board" will oversee both programs. The coordination board will contain the EU High Representative, the European Commission, the European Defense Agency, member countries, industry experts, other defense experts, and the EEAS. In other words, the EDF leadership structure is extremely vague and is still being worked on by member countries and the commission. (1) Nevertheless, surely someone will need to chair this board. If not the high representative, the EU commission could hire someone on to chair it, since the commission is responsible for the management structure of the program. Another think tank recommend that the commission chair the coordination board. Since it is covered in 666 connections, we would expect Solana to lead this board in the future. Since the Antichrist is a king who is really big into defense spending, the European Defense Fund is the perfect place to fulfill this prophecy. Again, this is also vague. This article implies that the Council will finish working out the details of the EDF by the end of 2017, though this is not entirely clear. Nevertheless, recall it is not just the Council that has to agree, but the Parliament as well (who are already working on it). As far as when the Commission will actually decide on the governance structure, it is anyone's guess. However, December would be a great time to do that, since the EU's December summit is dedicated to launching PESCO and will surely cover other defense related items. They also have a foreign affairs council a few days before the December summit, wherein PESCO formally becomes law. Since they are already determining PESCO projects, they will want to involve money from the new defense fund. Which again, implies they need to get on with deciding the rest of the EDF (and its leadership) before moving on too much further. Furthermore, if I was them, I would want to have the governance structure in place by the time both parts of the program become law. This would put a "terminus ad quem" at the beginning of March. Recall the EU parliament defense committee rapporteur on the EDF said they were in danger of not starting the program on 1 Jan. 2019 if it is not ratified by early 2018. 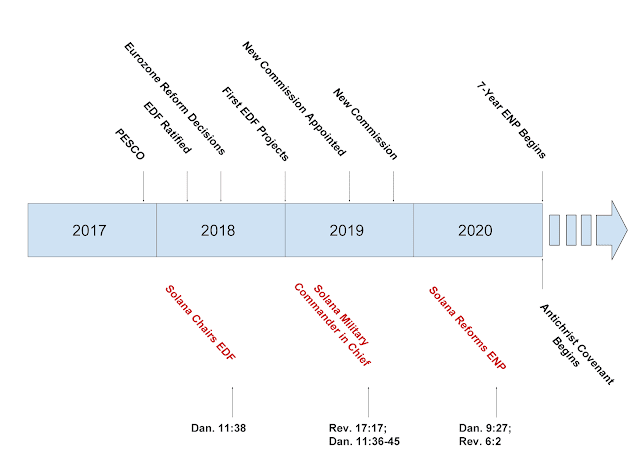 The time gap from 2018 to 2019 would be presumably used to decide what projects to embark on. Which again, requires leadership of some kind. Antichrist on a Tight Schedule? If you look at the prophecy radar, you can see the prophecies that have been fulfilled by the EU and Solana in the past, making him the best Antichrist candidate in world history. These prophecies in Revelation and Daniel that we allege he has fulfilled are very specific. Nevertheless, despite trying to influence EU policy from the outside, Solana doesn't currently hold and EU position. Which leads us to those prophecies he hasn't fulfilled yet. The radar also shows prophecies that seem to be "in progress." When considered, these are on a tighter schedule than one immediately presumes. At least 3 of the 4 listed on that page need to happen by 2021, probably in sequence. The items that need done in the next 3 years are listed below, in sequence. From a legislative standpoint, if the EDF is the way Solana makes his comeback, then we have already made the case how this could be relatively imminent. If not, summer of 2018 would be getting pretty late, with a hard stop of January 1, 2019. I suppose others could lead the fund before he does (since it is supposed to last until and through the next budget period). But nevertheless, you get my drift. The 666 connections usually don't precede his ascendancy by several years. ** However, a more reasonable time frame would be by the beginning of March, when both parts of the program become law. The original ten WEU nations (and whoever else wants to) have to give their "kingdom" to the Antichrist. This is in a military context, as the prophecy implies (see article #2). As a result, Solana must not only be in charge of defense spending, but become the EU's military commander-in-chief! This would presumably not come out of nowhere. Politically speaking, it would make most sense for him to be leading EU defense efforts in some capacity (i.e. the defense fund) beforehand. Then, the member countries who already know him and have worked with him would make him commander in chief. Perhaps this could take place in 2019, if the EU creates a dedicated defense commissioner. Unsurprisingly, the EU has a clause wherein they can obtain a common defense, if the European Council unanimously decides. Recall that appetite for defense integration has always been very low, until very recently. If we thought PESCO and the EDF were "historic" and previously politically difficult achievements, how much more would a common defense be! But that's not all. Almost every single thing on this website has a hard stop at January 1, 2021! This is when the EU's next budget goes into effect, which will probably be 7 years, as it usually is. This is important because the EU already has a 7-year contract with Israel and other countries based on this budget, which rotates every seven years (see article #3). This European Neighborhood Policy (ENP) coincides with the EU's seven year budget. If Solana is the Antichrist, at his age, January 1, 2021- Dec. 31, 2027 is our last shot at the ENP being the 7-year contract of Daniel 9:27. Though Solana helped make the ENP (before it was turned into a 7-year instrument), it is widely acknowledged to be a pretty bad failure, despite numerous "upgrades" to it. One person close to Solana also acknowledge it to be in a state of "obsolescence." Furthermore, according to those listening to a speech by him on Twitter, Solana declared the ENP dead saying "I think ENP is over." Not only does Solana have to make the ENP "strong" or "confirm" it for 7-years, it probably also has a security component to it, wherein it guarantees military protection to member countries. In order to guarantee military protection, one has to be military commander in chief. This would imply that after becoming military commander in chief, Solana reforms the ENP and guarantees protection to member countries, including Israel. In order to guarantee military protection for seven years, one has to be military commander in chief. In order to be military commander in chief, it makes sense that he would be a familiar person already working on EU defense, perhaps on the EU's new defense fund. So we see how items 1, 2, and 3 probably have to occur in sequence, especially considering the delicate nature of politics surrounding EU defense. On top of all this, it has to all happen in 3 years. Jan 1, 2021 may seem a long way away now. But 3 years suddenly seems like a really short time, when you consider all that probably has to happen before then. This is why I speculate that the Antichrist is "on a tight schedule." See the chart below for a visual representation of this. The top part of the chart represents planned political events. The bottom part of the chart represents various Bible prophecies, with speculative time frames for their fulfillment. (Click the chart to enlarge it and have better resolution). (Click the chart to enlarge it and have better resolution). Who knows? Maybe 2017 will be the year of the comeback. Recall the article called "Watchful Waiting on European Security." The last sentence reads: "As Europe enters 2017, watchful waiting continues. But for how long?" Jesus is coming soon. If we are not on the right track, I pray that God severely derails us, and doesn't leave us hanging. It would be very disappointing for such a thing to happen again. Nevertheless, keep praying for Jesus to come soon, and for wisdom on prophecy. As weird as it sounds, pray that Solana will be unveiled soon. Because with that, comes pretty game-changing evidence that Jesus is coming soon. And if Jesus is coming soon...we have nothing to fear. We may possess nothing. But we already have everything our wildest dreams could ever ask for. It is only a matter of time until we are ushered into his presence, with eternal glory. *This is with the exception of Solana's presentation to European Parliament on 06/16/16. This report focused on how to use PESCO to jointly develop capabilities and create an EU defense union. ** Document 666 and Recommendation 666 both preceded their entry into force by approximately 6-8 months, which is not a long time frame as far as prophecy is concerned! all of these factors when coupled together tell me that the man of sin is not far from his debut. tight schedule indeed! again, as always, good job keeping the eye on the prize! Jesus told us to watch! He has it all figured out---so that burden is not on us---but to watch--our eyes on the prize to stay watching for His handiwork still going on in this world rather in spite of the devil ;) ! so we have been given command--and watch, we will! praise the Lord He has not left us without hope in the darkness that is taking over this world system today! Great thoughts Andre'! Indeed the Antichrist needs that apostasy beforehand to really get things going. As you wisely point out, it is easy to see all sorts of lawlessness working behind the scenes. False teachings bedevil the church on every side. Just the other day I was arguing with someone on Twitter who thought some random guy was the Messiah. Sadly, the guy has a stronger following than I thought. It will only get worse as it progresses. Indeed persecution is already very bad but will get dramatically worse, I think, and precipitate a full-blown apostasy in the coming years. Furthermore, it's really interesting, some scientists are projecting an increased period of seismic activity over the next 5 years. Soon the birth pains will be upon us. Once the EU consolidates power, Russia will not be too happy about that and will probably invade the EU (Dan 11:40). Then it will all spiral out of control, with famines and perhaps economic crises in it's wake. I have been more anxious lately than I thought I would be. Javier Solana keeps me up at night, though it seems silly to admit. I am afraid this will turn out again like it did in mid-2010, when nothing came of the ENPI 7-year halfway point and Solana retired. But God is faithful. Short time or long, he will bring it to pass. I was filled with anxiety over the situation but God has been strengthening my heart lately. May God's peace dwell on you Andre' as you overflow with wisdom, knowledge, and hope in your heart. oh boy, i'm not sure of just what to say right now besides Thanks for the perspective, i sure needed that. i'm gonna continue to watch...in peace. Shalom David, Shalom Andrea * this is tony in vt. Thanks for your kind words Tony! May God strengthen your heart with hope every day through our Lord Jesus Christ! we sure need Him to be our all, as the all of this world continues to crumble. and more quickly everyday! the Blessed Hope is our Lord and Savior Jesus. watching with you brother :) and hope all is well with you and yours. we must stay in the Word and keep praying for Wisdom from on high. the devil may be crafty, but our God is the LORD!! !